As PNC presents Wide Open Bluegrass draws near, more and more excitement is building. We turned to PineCone, Piedmont Council of Traditional Music, executive director William Lewis for a rundown of his "can&apos;t-miss" happenings slated for the event. Attendees can experience the festival in two ways: via ticketed shows and through the free StreetFest stages. The ticketed portion of the two-day festival will feature some of bluegrass music&apos;s biggest names and brightest stars including Sam Bush Band, Jerry Douglas and many more. Half of the proceeds will benefit the Bluegrass Trust Fund, a nonprofit established by the International Bluegrass Music Association (IBMA). Tickets for the Red Hat Amphitheater concerts are limited as the Fri. concert has already sold out. Get Sat. tickets before they sell out here! 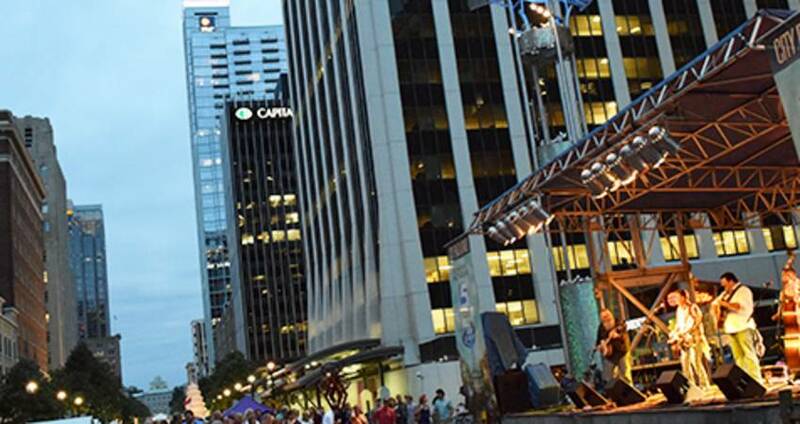 The free Wide Open Bluegrass StreetFest, held in downtown Raleigh along Fayetteville St., will feature more than 80 bands, five music stages, a dance tent, vendors and concessions. Performers include a broad mix of local, national, and international talent. The Youth Stage, a special stage near the convention center, will feature performances and activities from the future stars of bluegrass. Part of IMBA&apos;s World of Bluegrass, the Bluegrass Expo is a central gathering place, with more than 20,000 visitors browsing the latest industry wares, conducting business and networking. The Expo features a wide variety of vendors, gear, services and products for the bluegrass professional and fan, alike! Workshops hosted by master bluegrass musicians are offered throughout the day covering a variety of topics from instrument care to songwriting tips to live coaching sessions. Attendance to both the Expo and Workshops is free on the weekend. For the third year in a row, the N.C. Pork Council&apos;s Whole Hog Barbecue Championship will take place as part of Wide Open Bluegrass, as well. Barbecue lovers will find multiple options to learn about whole hog barbecue and tempt their palates during the festival, including three dining options and the Whole Hog Barbecue Championship.